Matthew S. Kennedy graduated with his Juris Doctorate of Law in June 1986. Practicing law since 1986 in all aspects of Real Estate law, Business and Civil Law/Litigation, and Business Transactions. Mr. Kennedy also has been admitted to practice in Federal Appellate and District Courts. Mr. Kennedy likewise is a long-time resident of San Luis Obispo and a graduate of Cal Poly. Dedicated to the highest standards of professional excellence and service to the community and the legal profession, Mr. Kennedy participates in the American, California and San Luis Obispo County Bar Associations and other professional societies. Mr. Kennedy's efficient, modern approach to the legal system enables him to thoroughly, efficiently and economically represent all clients. State-of-the-art computers, computer peripherals, a near paperless office, and subscriptions to the latest on-line legal research providers allowing the most current and up to date court rulings and interpretations available, gives Mr. Kennedy the cutting edge when addressing murky legal issues. Mr. Kennedy represents manufacturing firms, retail businesses, service organizations, banks, restaurants, venture capitalists, real estate developers, real estate brokers, franchisors and franchisees. Conveniently located in San Luis Obispo, Mr. Kennedy effectively serves the Central Coast and is sensitive to the local market's budgets and needs. Mr. Kennedy and his firm look forward to hearing from you! Matthew S. Kennedy is proud to offer the combined services of a seasoned and trusted real estate and business transactions attorney, with a residential/commercial real estate and business opportunities broker. 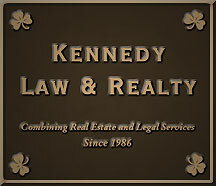 Since 1986, Mr. Kennedy has concentrated his legal practice in the areas of real estate and business opportunities sales. During his practice, he has represented individual and entity clients in negotiating and drafting both routine and complex real estate and business acquisition agreements, and managed those transactions through closing. In addition he has provided legal advice on business, real estate and personal transactions to both large and small corporations, financial institutions, general and limited partnerships and sole proprietorships. In March 2005, after recognizing a need to assist his extensive real estate and business clientele and community, he became a California Real Estate Broker. As a long time and continuing practicing real estate and business transactions attorney, and now as a licensed real estate broker, Mr. Kennedy can offer his clients a unique and complete package of professional services and skills essential in today's realty and business transactions market. Family, tradition, hard work and dedication to one's craft are essentials for Mr. Kennedy and he sincerely looks forward to proving his worth to you as a real estate and business broker.